1.) Said good-bye to these fine people. Abuela fed us something delicious from her kitchen every few days. Abuelo came each evening to water the planters and hose off the tiled patio. 2.) Watched the 6th stage of Vuelta a España, a multi-stage cycling race similar to the Tour de France. We walked into downtown La Zubia to cheer the cyclists on as they sped by in 37 degree heat. I do not know how these athletes race in the blistering heat. 3.) Took one final swim in the pool. We loved bobbing around the pool. At 8:00pm we drove to Malaga. We stayed overnight at a hotel, getting only 4 hours of sleep. The first of our three flights left at 7:00am the following morning. Our flight from Malaga to Paris was uneventful. Our flight from Paris to Amsterdam was uneventful. Our flight from Amsterdam to Vancouver was eventful. We boarded the airplane and quickly found our seats. I was carrying a very large Moroccan ceramic platter in my shoulder bag. While the bag fit under the seat on the first two airplanes, it did not fit under the seat on the third. I stood up and turned to give Joe my bag to stow in the overhead bin. And that's when it happened. My body turned toward the aisle but my foot and knee didn't. I heard a loud POP and instantly felt a pain on the outside of my knee. I abruptly sat down. Joe finished storing our carry-on luggage and sat down beside me. "I think I've hurt my knee." Joe called one of the flight attendants over to explain the situation. The KLM crew was at once caring and helpful. Bags of ice were brought to me on the hour. They kept checking in with me to see if I was okay. It wasn't until I needed to use the washroom that I discovered how painful my knee actually was. I stood up and tried to walk. My knee wasn't having any of it. I could not straighten my leg or touch my foot to the floor. So I sat back down and held my bladder for the remaining 9 hours. Seven hours into the flight I told Joe there was no way I could walk off the plane. He called an attendant over and asked if a wheelchair could be waiting for me when the plane landed in Vancouver. The plane landed, all the passengers disembarked and there I sat. Joe grabbed our 2 carry-on suitcases, his backpack, along with my bag containing the platter from Morocco and headed down the aisle. I had to get myself from row 27 to the front of the airplane. I grabbed each armrest and hopped on my good leg. What a gong show. 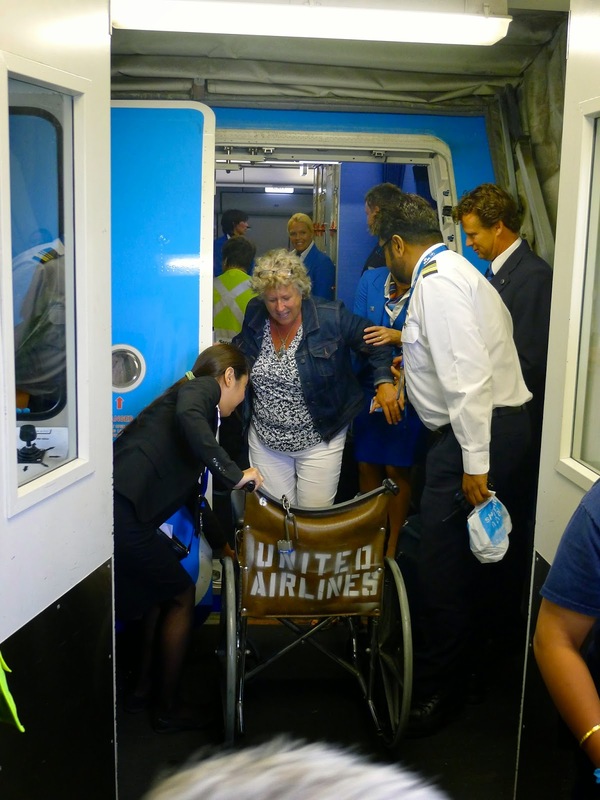 And there, waiting at the airplane door was a wheelchair! Not only a wheelchair, but the entire crew had gathered to make sure I was okay. HOW EMBARRASSING! I plunked myself in the chair and this tiny woman grabbed the handles. "Honey," I said. "You are going to push me up the ramp?" And with that she turned the chair around and pulled me all the way into the terminal. And where was Joe throughout all of this you may ask? He was front and centre taking photos to document the ordeal. I also got to ride in one of those big goofy golf carts. And the icing on the cake? Joe and I got to bypass hundreds of people and went directly to the head of the line at the customs and immigration booth. Me and my fellow passengers going for a ride at YVR. This was not the way I envisioned my trip ending. But thank goodness it happened at the end of our vacation and not the beginning. And there was even more good news! I went directly to the emergency ward when we arrived in Squamish and the good doctor told me it was only a very severe sprain. No torn ligaments. No surgery needed. I am taking Advil, resting, hobbling along with the help of a cane and a set of crutches. I will be fine. Just fine.